This edition of Eating Around Town was written by Abbey Becker. Abbey previously wrote about Boundary Stone. She lives near Eastern Market. 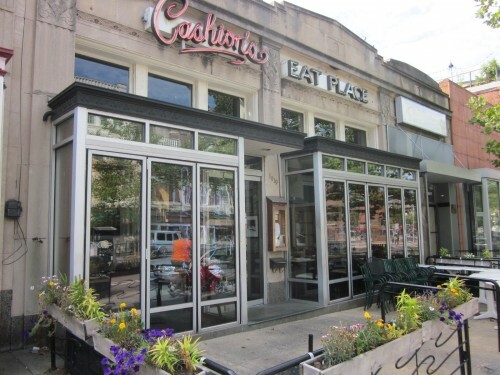 Since its opening in 1995, Cashion’s Eat Place (1819 Columbia Rd NW) has always done its best to cook with local ingredients, and it cooks them well. But for a restaurant that’s been around as long as Cashion’s, it’s understandable that though their menu is priced right around other mid-priced to upscale restaurants (depending on your interpretation) in the District, it’s often overlooked by diners. The proprietors themselves admit that their clientele tends to be on the older side, and that younger generations tend to bypass them for restaurants that are new to the city. Cashion’s held a small preview dinner earlier this week to showcase the additions to their menu and the updated decor, and I was lucky enough to be included as a contributor to PoPville. Let me say up front that while I am always up for a free meal, I’m wary of someone trying to “sell” me on how innovative the food is, how underrated they are, etc. But everything I ate was flavorful, balanced, and clearly made with care, and it’s obvious that the owners truly love what they do. Chef John Manolatos has been at Cashion’s since the first day it opened. He had no culinary training aside from working in a deli making sandwiches, but the kitchen took him on and taught him the skills that eventually made him sous-chef. Because of the mentorship he received, he had made it a point to hire kitchen staff not based on experience or professional training, but on the enthusiasm they bring. Justin Abad, the longtime general manager turned owner who also chooses the wine list, has worked at Cashion’s for the majority of his career. He’s an excellent host–personable, knowledgeable, and eager to please–but it’s clearly genuine. You can tell there’s nowhere he’d rather be. While service is certainly important, it’s the food that’s going to keep you coming back. Cashion’s hasn’t taken anything off their menu, though it does change seasonally. 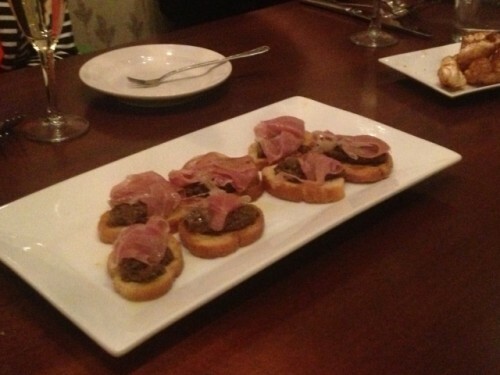 Manolatos added a section to the menu called “For the Table,” which is made up of small plates with prices that are much more palatable than the $35 dorade or the $42 dry-aged rib eye. Dishes I’d recommend include crispy fingerling potatoes with garlic aioli ($7); dry-aged crispy lamb skin ($7), which may sound strange, but it’s almost like a really lamby jerky; Tuscan liver crostini with prosciutto di Parma ($9)–this doesn’t taste much like liver, but more like a warm-spiced, meaty spread topped with delicious ham; Szechuan-roasted peanuts ($4), which are ridiculously addictive; and the pork rinds with smoked paprika ($4). If you’re looking for something more substantial, try the caramelized lamb ribs with scallions and lime ($12) or the Pennsylvania-raised goat, spit-roasted and pulled, with fresh chilies, caramelized onions, cilantro, black-eyed pea salad, grilled flat bread and tzatziki ($27). I know this last one might sound like it carries a hefty price tag if you’re more into the small plates price range, but trust me–this will be enough for two people if you’ve gotten a small plate or two in addition. I’d had goat once before and I remembered it being gamy and chewy, but this goat preparation has changed my mind. Chef Manolatos roasts the goat on a spit for five hours, until the goat is falling off the bone, and serves it with the best (and most garlicky) tzatziki I’ve ever had, pickled artichoke leaves (zesty and clean), serranos, and cilantro. I’m going back for this one for sure.